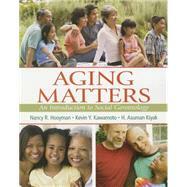 by Hooyman, Nancy; Kawamoto, Kevin S.; Kiyak, H. Asuman S.
Aging Matters illuminates cultural, biological, physiological, emotional, cognitive, economic, and social aspects of aging. A useful guide to a range of disciplines, this title helps readers of all educational backgrounds understand the dynamic interactions between older people and their environments. Nancy Hooyman holds the Hooyman Professorship of Gerontology and dean emeritus at the University of Washington School of Social Work. She is author of 12 books and over 130 articles and chapters. Her books include a widely used text, Social Gerontology: A Multidisciplinary Perspective (9th Edition); Aging Matters: An Introduction to Social Gerontology; Feminist Perspectives on Family Care: Policies toward Gender Justice; Taking Care of Older Relatives, one of the first widely used books on family caregiving, and Grief and Loss: Interventions across the Lifespan. She is Principal Investigator of the Council on Social Work Education’s (CSWE) National Center for Gerontological Social Work Education. She is the recipient of the 2009 CSWE Significant Lifetime Achievement Award in Social Work Education and the 1998 Lifetime Achievement Award from the Association for Gerontology Education in Social Work Education, and was inducted into the American Academy of Social Work and Social Welfare in 2011. Dr. Kevin Y. Kawamoto, a faculty member at the University of Hawaii at Manoa and previously at the University of Washington in Seattle, received his Ph.D. in Communications and M.S.W. (with a specialization in multigenerational social work) from the University of Washington. A former student of Professor Nancy R. Hooyman, he has helped to update her co-authored text Social Gerontology: A Multidisciplinary Perspective and worked on other projects with her over the years. His research interests include issues related to aging and technology; aging and mental health; and active aging. Chapter 2: Global Aging and Older Immigrants in the U.S.
How Do We Study Older Adults? Longevity in Health or Disease? What does the Future Hold? Can Computer Games Promote Elders’ Well-being? Why Consider a Career in Aging?